Anchor Animal Hospital in Dartmouth wants to help local pet owners to use knowledge about potential safety issues, which can ultimately require emergency vet care for cats and dogs, to help keep their pets out of danger throughout the year. As the leading Southeastern Massachusetts emergency vet, serving pet owners throughout the entire South Coast region, we see a lot of cases where pets get injured or sick that could have been avoided. Whenever the seasons change, there are new things to be learned to help keep your pets safe. Whether you have a cat, dog, small rodent, reptile or bird, it is important to learn all you can to keep them happy and healthy. The worst thing you can do as a pet owner is to allow your pet to have access to Halloween candy. While not all candy is chocolate, a good deal of it is. All forms of chocolate – even chocolate coated candies – can be toxic to your pets. New Bedford pet owners and pet owners all across the country would do well to keep candy up high where pets can’t reach. If you have cats, putting candy into a sealed jar or keeping it in the fridge can also be recommended. Baking chocolate, dark chocolate and even white chocolate can all be dangerous, so make sure to keep it all out of reach. Symptoms of chocolate poisoning in pets can include diarrhea, vomiting, rapid heart rate and breathing, seizures and lethargy. Visit our website’s Chocolate Toxicity Calculator to help you figure out whether your pet is in danger. When in doubt, contact Anchor Animal Hospital in Dartmouth by calling 508-996-3731 or bring your pet in for an emergency check-up at our State Road location. We are now open 7 days a week for appointments and emergency visits. Halloween can be a very scary time for your pets. Pranksters have a reputation for teasing pets, scaring them with their costumes and masks – or worse. Every year thousands of pets go missing on Halloween, either due to breaking out of their yards with the increased foot traffic on the street, being let out by pranksters or being stolen. Black cats are a particular target of these real life ghouls, but all pets should be brought indoors at sunset and taken out only on a leash after the trick-or-treaters are gone, just to be safe. In fact, some animal control districts recommend that outdoor cats be kept inside a week before and a week after Halloween and there are many animal shelters that will not adopt black cats out during this period just to be on the safe side. Just like pointsettias at Christmas, there are specific plants that are out more in the fall than any other time of year. While most of these plants are non-toxic, they can attract dogs and cats to chew on them or even ingest them. One of the biggest worries is an intestinal blockage, which can occur with live plants and even silk varieties if you have a pet that is known to eat non-food items on a regular basis – or even on occasion. Pumpkins and dried corn displays should be kept out of reach to ensure pets don’t try to eat them. 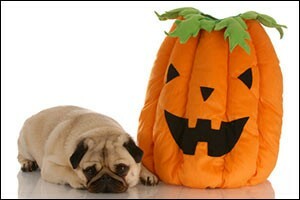 Many of the decorations that we use around Halloween can be dangerous to pets. Lit pumpkins can get easily knocked over or a curious pet can burn whiskers or paws by getting too close. Electrical light cords used for holiday displays can get chewed on, causing electrical shock, or pulled on, causing the decorative item to fall over, break and cut delicate paws. Even cotton “spider webs”, which are very popular for interior and exterior decoration, can cause a serious or life threatening injury if ingested or if the pet gets caught in the material. If your pet becomes injured by Halloween decorations, gets burned by a pumpkin or candle, ingests any decorative items, candies or other party supplies, make sure to bring them in right away to receive vet care for cats and dogs at your Southeastern Massachusetts emergency vet. Fall River, Westport and New Bedford pet owners can call Anchor Animal Hospital in Dartmouth, Massachusetts to find out more about regular check-ups and emergency services by dialing 508-996-3731. One of the most challenging aspects of being a pet owner is learning what needs to be done in order to keep them healthy and safe. The best way to do that is to get your information straight from the doctor’s mouth. Bring your pet in for an annual check-up at Anchor Animal Hospital in Dartmouth to ensure that you are providing the proper dietary, safety and vet care for cats and dogs, as well as other types of pets. Make sure to speak with the veterinarian about the proper care and feeding required for your pet, including vaccinations, preventive treatments and other services that can help to give your pet a long and healthy life. Call today at 508-996-3731 to make an appointment or to learn more about the services we provide.